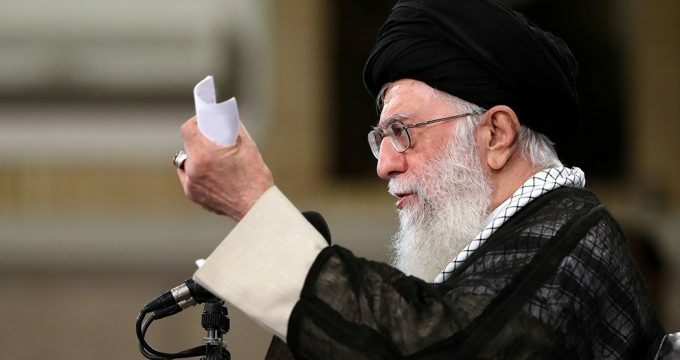 Khamenei.ir – Ayatollah Khamenei—the Leader of the Islamic Revolution—held his Dars-e Kharej Fiqh lecture on Monday, October 15, 2018– wherein his eminence elaborated on a letter by Imam Ali that contains recommendations for the authorities. Ayatollah Khamenei—the Leader of the Islamic Revolution—opened his Dars-e Kharej Fiqh lecture on Monday, October 15, 2018, by elaborating on a letter by Imam Ali (a.s.) addressing the officials and military commanders (letter 50; Nahjul Balagha). He mentioned some of the responsibilities of the officials and commanders as explained by Imam Ali (a.s.) and regarded this letter as a code of conduct for all individuals with managerial roles within an Islamic establishment. Then, referring to some excerpts from the letter, he maintained: “In the logic of the Alawi governance [Imam Ali’s manner of governing], if someone—due to the responsibility they are given—reaches a certain social position or privilege, their position should not influence the way they treat the people, distancing them from the rest of the people”. Elaborating on this sentence from Imam Ali’s letter, he asserted: “This is an extremely important point. Transparency—which is insisted on today—already exists in the words of Imam Ali (a.s.). Some individuals are into the habit of crediting the West for any good quality that exists in the Islamic society. One is appalled by the extent of their low-mindedness of these individuals. Some say that values such as caring for the people, being attentive to their votes, and promoting the well-being of the people are [qualities] transferred to us from the West. When you do not refer to Islamic resources when you do not study the words of Imam Ali (a.s.) and the honorable Prophet of Islam (pbuh), you are not familiar with them, and so you refer to the West. Some say that transparency is something we learned from the West. This is not true; because, Imam Ali (a.s.) teaches about transparency. He says: Your right upon me–that is, the right you have and I need to observe it– is that I should not keep anything secret from you except during wars when we face an enemy. During wars, we cannot share all the words, because if you can learn about it, the enemy will also be able to learn about it. So in the matters of war, including military war, security issues, defense and foreign affairs, we should not be transparent. Nevertheless, in other affairs, general matters of the people, “I should not hide from you anything as secrets”.